At this page, I introduce the thing which was taste different taste from my expectation. "Bitter !" I hit on only this word. I drank this coffee in the smart coffee shop which a foreigner seemed to go well. However, milk did not follow it though the sugar followed it. I hear that they drink this coffee as medicine at the time of diarrhea in Vietnam. 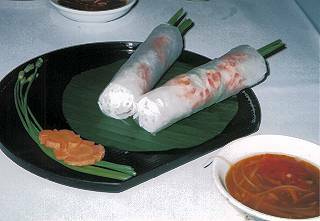 They wrap variousl appetite materials for such as spicy grass, shrimp, leek, harusame, with raw rice paper. This is one of general Vietnam cooking and they sell even a stall of the roadside. I smelled a flavor of raw rice in the moment I bit... It is just the taste that they crush rice, dissolve it with water and bake it. Though fragrance of spicy grass is stronger than smell of rice, I was calm. Next page ..."8. Tonnel in Kuchi"